Some parts of the castle had fallen into disrepair and in 1630 Sir Thomas the younger began a programme of improvements to sections of the building. During the next two years he spent £270 on the refurbishment of the chapel, of which a sum of £150 was set aside for the provision of an organ. Sir Thomas also decided to institute choral services there and the organist of Wrexham parish church, William Deane, was invited to take charge of music at the castle. Sir Thomas requested Deane to prepare a set of part-books for use in the chapel and the six manuscripts (five vocal part-books and an organ-book) were soon completed. The onset of the Civil War brought a temporary halt to all choral activity at Chirk. Sir Thomas initially fought with the Roundheads and commanded the Parliamentarian forces in North Wales. However in 1659 he openly declared his support for Charles II but lost Chirk in one of the last engagements of the Interregnum. Following the restoration of the monarchy in 1660, and the re-occupation of the castle by the Myddelton family, some attempt was made to restore choral singing at the chapel. Copying of music was begun again and a few three-part devotional pieces were entered into the part-books. Unfortunately this revival was short-lived and sometime before the end of the century the chapel music books were consigned to the castle library, where they were to remain for three hundred years. At some point, probably before the library was inventoried in 1736, the quintus part-book was lost; meanwhile, the organ book found its way to Oxford via the bibliophile Dean of Christ Church, Henry Aldrich (d1710). In 1969 however, the Myddelton family decided to send the four part-books still in their possession to Sotheby’s London salerooms where they were sold to the New York Public Library. The Chirk manuscripts contain works for unaccompanied voices as well as verse anthems and services, scored for solo voices, chorus and organ. This recording focuses on the unaccompanied items, presenting for the first time a selection of the ‘full’ services and anthems found in the manuscripts, including seven unique to the Chirk collection. The choir at Chirk was undoubtedly small, probably numbering around ten to twelve singers and in using a similar number of musicians The Brabant Ensemble has sought to recapture the intimacy of Deane’s performances in the chapel. Among the ‘new finds’, the most significant are the Te Deum and Benedictus ‘for trebles’ by William Mundy (tracks 1 & 2). The two settings are designed on a large scale, exploiting the use of high trebles, and Mundy cleverly employs choral groupings of various types to provide maximum contrast. The textures throughout are reminiscent of Sheppard’s best Latin compositions and by intensifying the contrapuntal activity in the closing sections of both canticles, Mundy takes the music to an even higher level. This is the first recording of these important canticles; the treble part must have been included in the lost part-book and it has therefore been reconstructed by the present writer. The Chirk scribe ensured that suitable services and anthems were provided for all aspects of worship at the chapel. The attribution of the Burial Service to Alcock (fl c1570) is doubtful for it is ascribed in several Restoration copies, no doubt erroneously, to John Parsons (d1623). Its unattributed survival in one of the Ludlow manuscripts in an early form of Anglican notation however suggests that composer may well be none other than Robert Parsons, best known for his exquisite motet Ave Maria. If so, this is possibly the earliest extant setting of the Burial Sentences and the dignified measured tread of the music is well suited for singing in procession. The Litany ‘for trebles’, also credited to ‘Parsons’, is a rather free adaptation of Tallis’s famous setting, although its upward transposition in the part-books gives the music a lighter and more spacious feeling. The first music entered into the Chirk part-books was Tallis’s widely distributed ‘Dorian’ Service. Following the Creed is a short Offertory, a setting of one of the Communion Sentences, Not every one that saith unto me, which has survived only in the Chirk collection. It comprises just three musical phrases yet bears the distinctive stamp of Tallis’s chordal progressions. In contrast, Christ rising again is an extended work, divided into two clear parts and based on a text used only at Morning Prayer on Easter Day. Tallis’s setting shows his fluency at five-part imitative writing with some passages of strong rhythmic contrast, such as at the words ‘by man also cometh the resurrection of the dead’. The anthem ends with a rising sequence of Alleluias, underscoring the resurrection theme of the text. The life of William Deane of Wrexham is shrouded in mystery. Documentary evidence places him in North Wales between 1630 and 1638 but he was undoubtedly not native to the area. It may well be that he is synonymous with the William Deane, a chorister at Salisbury Cathedral, who, in 1592, saved the life of Dr Bridges, the cathedral’s dean. The two services and five anthems attributed to Deane are found only in the Chirk manuscripts. O Lord, thou hast dealt graciously, a five-part setting of verses from Psalm 119, has many unexpected twists and turns which arise in response to the unusual text. Deane shows a lively feeling for the sound of the Psalm words, such as ‘but my delight hath been in thy law’ and ‘Their heart is as fat as brawn’. The concluding Gloria includes a strict canon between the medius and tenor parts culminating in a fine Amen. Settings of the closing words of Evensong are exceedingly rare and Deane’s delightfully understated miniature, The grace of our Lord Jesus Christ, perfectly captures the tranquillity of the text. Although the Chirk manuscripts were copied around 1632, they contain a high proportion of music from the previous century. Sheppard’s setting of Psalm 67, O God be merciful unto us, and bless us is based on regular points of imitation which are often repeated, ending with a lively Gloria, cleverly culled from the music of the preceding section. Blessed are all they that fear the Lord, a setting of words from Psalm 128, is entitled ‘the marriage song’ in the part-books. 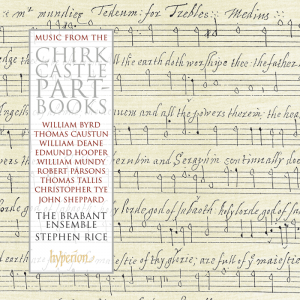 It is one of Christopher Tye’s most unpretentious yet well-wrought anthems, in which chordal textures predominate, relieved occasionally by short passages of imitation. Sheppard’s Submit yourselves one to another is similarly unassuming, yet more imitative, and adopts the formal pattern ABB often used in early Anglican anthems for lower voices. In complete contrast, Robert Parsons’s dazzling technical skill as a contrapuntalist is demonstrated in his six-part anthem Deliver me from mine enemies. The two soprano parts are in strict canon throughout and below these Parsons weaves a magnificent web of imitative counterpoint closely related to the canonic themes. The version in the Chirk manuscripts omits several repetitions of material present in other sources; they have been reinstated here in order to bring an enhanced symmetry to Parsons’s brilliant writing. Anthems based on metrical texts are well represented in the collection. Byrd’s five-part O God give ear and do applycomes from Psalms, Sonets, and songs of Sadnes and Pietie (1588) but may well have been originally conceived as a consort song. He sets the first four stanzas of Psalm 55 and achieves a fine balance between rich homophony and suave contrapuntal writing. The text of Thomas Caustun’s Yield unto God the mighty Lord, is a version of Psalm 150, recast—at times rather poorly—into metrical English (for instance, ‘Whatever hath the benefit of breathing’, whereas the prose version in the 1549 Book of Common Prayer reads ‘Let everything that hath breath’). It is probably one of the oldest pieces in the manuscript, written in a strictly syllabic style, relieved by simple imitative passages which serve to emphasize the exuberance of the text. It is likely that the Chirk scribe had close connections with London and obtained a number of contrafacta (pieces whose text is not the one originally set) from John Barnard of St Paul’s Cathedral. With all our hearts and mouths is an English adaptation of Tallis’s superb motet Salvator mundi. Although the English text fits less comfortably with the music in places than the original Latin, Tallis’s dense counterpoint loses none of its impact. The Chapel Royal composer Edmund Hooper’s Behold it is Christ was popular in his own day. The music has an unusual intensity of expression enhanced by unorthodox twists of harmony and much use of false relations. The remarkable way in which Hooper threads the motif ‘whosoever believeth in him’ through the texture shows how secure was his technical control of contrapuntal writing. Taken as a whole, the Chirk Castle manuscripts show a fascinating aspect of seventeenth-century musical life on the Welsh borders. Pieces up to eighty years old were still in use in this small chapel choir; some of the earlier anthems were occasionally adapted to fit contemporary taste. Modest as it may have been, the chapel establishment of the Myddelton family kept the flame of Elizabethan music burning in the Jacobean era.